For the first time ever, aspiring and established producers are invited to an open casting call for the latest EBE Nation release, EDM Mafia E.P., due out spring/summer 2019. Rap legend and cultural icon, Ice-T, has teamed up with Mr. X, a world-renowned techno DJ/producer. 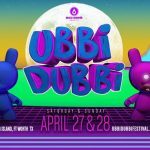 About a year ago they developed a record label, Electronic Beat Empire, aka EBE Nation (read the EDM World interview here) and have been releasing hit music from the label. The record label is currently looking for techno, dubstep, and all electronic music producers and remixers. Producers will compete for upcoming Mr. X projects. Such projects include EDM MAFIA, the forthcoming E.P. from Electronic Beat Empire due out this spring or summer. 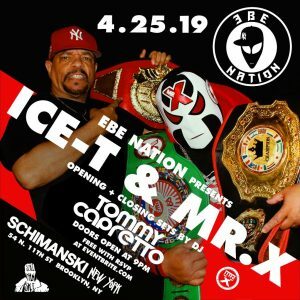 The same amazing ICE-T and MR. X duo will be hosting a very special performance, a show for their electronic dance music label, ELECTRONIC BEAT EMPIRE (EBE NATION) at Schimanski on Thursday, April 25th, 2019. Possibly filmed for television, there will be the one-and-only ICE-T on the mic with killer beats dropped by MR. X. Moreover, in addition to giving you the rawest, most lively techno/tech-house, rap-rock-pop and EDM musical combo to grind to, they will also continue their search for new talent. 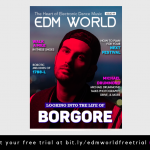 Are you the next EBE break out DJ or just an EDM junkie? Get your FREE tickets here and tag a friend in the comments below who you think would like this event and opportunity. Ice-T is a rapper, actor, and record producer whose influence on American pop culture is pervasive. Once an edgy and controversial rapper, Ice-T is as relevant in pop culture today as any mainstream actor/musician/entrepreneur. He is widely known as an actor with his recurring role as Detective “Fin” Tutuola on Law & Order: Special Victims Unit. The show is now in syndication for which he starred since 2000. It is on track to become one of the longest-running television programs in history. It’s ironic that Ice-T’s most notorious early rap song was a 1992 track titled, “Cop Killer.” It was a metal and punk-rock song that left an indelible mark on pop culture. Ice-T’s 1988 song, “Colors,” is the theme song for Dennis Hopper’s gang-based film of the same name. Other albums by Ice-T in the 80s and 90s cemented his status as one of the West Coast’s most promising voices. For example, his album O.G. Original Gangster (1991) is often cited as a key factor that influenced gangsta rap. Mixing social commentary with inflammatory lyrics, Ice-T pushed musical boundaries, achieving multiple Billboard hit singles. Additionally, he collaborated with heavy metal bands, Black Sabbath and Slayer. Early film acting roles for Ice-T (real name: Tracy Lauren Marrow) include New Jack City (1991), Ricochet (1991), Trespass (1992), and Johnny Mnemonic (1995). With wife, Nicole “Coco” Austin, Ice-T was the star of reality TV show Ice Loves Coco, on the E! Entertainment Television Network. Mr. X has been a fixture on the European techno scene for 16 years. He was a part of the group known as Mr. X & Mr. Y. As a DJ and producer, Mr. X, also known as Afrika Islam, has thrilled audiences. He performed at legendary raves such as the Glastonbury Festival, Berlin’s Love Parade, and the seminal Mayday Festivals across Europe. Equally imnportant, nightclubs across the European continent saw Mr. X performing throughout Germany, Poland, Russia, and the Czech Republic. The die-hard techno music-lovers of Eastern Europe even affectionately dubbed him the Machine Gun, the Red Alien, Master, and the Hybrid. The nicknames arose due to his legendary 50-track DJ sets. Furthermore, mainstream media outlets in Europe embraced Mr. X, and he appeared on the British television program, Top of the Pops. Also, Mr. X was the first major artist signed to the newly launched Electronic Beat Empire record label. The first release was The Brutal E.P. The second album released on EBE was Hip Hop DJs Don’t Play Techno, which earned an enormous amount of media coverage and radio airplay in the U.S. in 2018. The album It Came From Space followed in December 2018, and the current album is Remixes & Remakes.